A large part of your utility expenses goes toward heating and cooling costs. Just take a moment and look at what you pay for gas and/or power each month. Not pleasant, is it? Luckily, there are ways to cut your energy costs without resorting to drastic measures. Smart thermostats automatically change the internal temperature of your home ahead of ambient temperature changes to reduce the amount of energy your HVAC system uses. We’ve taken a look at the top five smart thermostats and broken them down so you can see which one best suits your needs and how much it might save you. 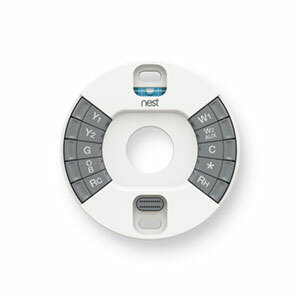 Nest prides itself on producing cutting-edge technology. We’ve recommended the Nest Cam for DIY home security, but the Nest Learning Thermostat also sets itself apart from the competition with several remarkable features. The Nest is a true “smart” thermostat. After installation, all you have to do is adjust the temperature the way you like it for the first few days. After that, the Nest will learn from your preferences and begin to change the temperature automatically. 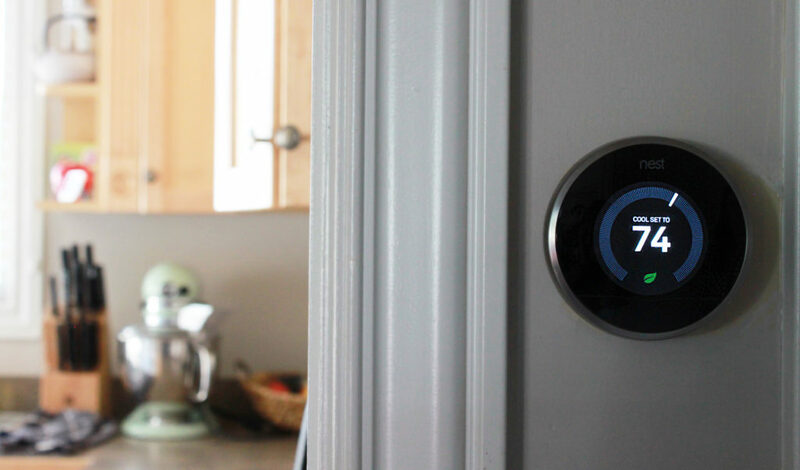 The current (third) generation of the Nest Thermostat includes a feature called Farsight. Using built-in proximity sensors, the thermostat registers when you’re in the room and activates internal lights, making it easier to read the display from the other side of the room. The Nest will send mobile alerts if the temperature rises too high or drops too low. It can even notify you when it suspects the furnace may be malfunctioning. The Nest will also remind you when it’s time to change your air filter. The Nest Thermostat uses your phone’s GPS to determine whether you’re home or away. When you’re away from home, the thermostat adjusts to “Eco” temperature—an energy-saving mode that allows your home to remain inside a specific temperature range while using less power. You can also control the fan, set up a temperature schedule (although Nest creates this automatically after the first few days), and establish family accounts. Nest will send you a monthly Energy History and Home Report, which shows you how much energy you’ve used and how much money you’ve saved compared to “normal” expenditure. The Nest doesn’t technically require a C-wire, but there are times when you might need one—like if the thermostat can’t pull enough power from the existing wires—so it’s a good idea to have one just in case. The thermostat is designed so that you can install it yourself without professional assistance. If you’re not comfortable doing it yourself, you can hire a Nest Professional, which will cost anywhere between $100 and $300. Installation should take between half an hour and an hour. 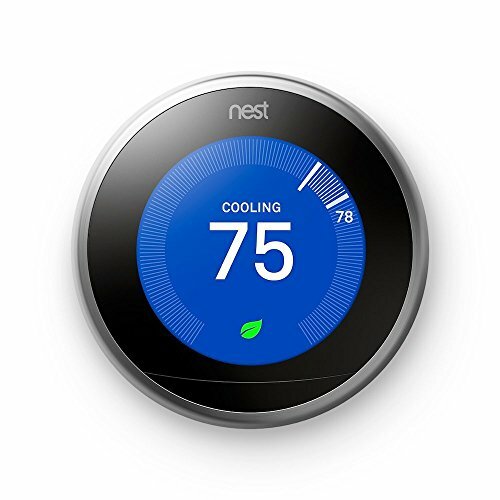 The Nest Learning Thermostat is compatible with the majority of HVAC system types, including gas, electric, forced air, heat pumps, radiant systems, geothermal, solar, and hot water systems. The same Nest account can be used to control thermostats in two separate locations, so if you have a vacation home, you can install a Nest Thermostat there and monitor the temperatures and conditions from anywhere. Nest claims to pay for itself within two years by saving customers anywhere from $131 to $145 annually. The thermostat adjusts itself throughout the year based on your preferences and environmental conditions to keep the temperature at the most comfortable level. This thermostat’s automatic learning, sleek design, and wide range of compatibility make it our number-one choice for best smart thermostats. The ecobee3 is the only thermostat on this list that stands as a direct competitor to Nest. It offers many of the same features, but it sets itself apart via room sensors that allow it to deliver heating and cooling to specific rooms rather than the whole house. The lack of automatic learning and more limited range of compatibility place it below the Nest in our ranking. The ecobee3’s main selling point is its integration of smart sensors. Rather than relying on whole-home heating or cooling, you can have it focus on certain rooms. The system’s smart occupancy detection that knows when someone is in a room means that the ecobee3 can truly help reduce energy costs. You can use up to 32 remote sensors throughout the home, but it’s unlikely you’ll need that many unless you live in a truly massive home. The ecobee3 also champions home automation with Apple HomeKit, Amazon Echo, IFTTT, Samsung SmartThings, and Wink integration. If the temperature isn’t just right, you can use your home automation system to change it, or program the system to respond to triggers like changes in humidity or the presence of a person in the room to automatically keep your home comfortable. The ecobee3 will send notifications to your iOS or Android mobile device if the temperature in your home is too warm or too cool. Monthly reports let you know how much energy you’ve saved and provide tips on how to improve those savings. On its website, ecobee boasts “fast, easy installation in 30 minutes or less.” The ecobee3 app provides a step-by-step installation guide that you can access on your phone while you install the device. While the ecobee3 normally uses a C-wire, it can be used with systems that lack one through the use of the Power Extender Kit included with every ecobee3. If you run into trouble, ecobee’s support team is highly rated and can help you through the process. The ecobee3 works with gas, oil, electric, conventional, and heat pump systems, and may work with other systems on a case-by-case basis. If you aren’t sure whether your HVAC system is compatible, refer to ecobee’s compatibility checker. The ecobee3 website claims the unit can save users up to 23% each year on heating and cooling. It competes directly with the Nest, and for the same price point, it’s a close race between the two. The multiple home automation integration options are a big win. However, the ecobee3 lacks the automatic learning of the Nest, and many customers want a thermostat that doesn’t require manual programming. While the Sensi is a “smart” thermostat, it’s not on the level of the Nest or the ecobee3. However, it is still Wi-Fi connected, controlled via smartphone, and able to link to Wink and Amazon Echo units. The Sensi keeps things basic for a smart thermostat. It has a few core features that we look for, but not a lot of bells and whistles. 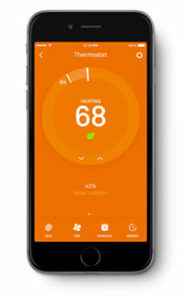 Most smart thermostats are first built, and then given a mobile app. Sensi, on the other hand, was designed around its mobile app, providing a better user experience. Not only can you change the temperature from your phone, but the app also keeps you informed of local weather, humidity levels, and your upcoming heating and cooling schedule. You can set up a custom seven-day schedule for heating and cooling. While a set-it-and-forget-it schedule makes life easy, you can also change the temperature at any time if you aren’t comfortable. Sensi also works with Amazon Echo and Wink for smart home integration, as well as with Android and iOS devices. That said, the Sensi can’t work with remote sensors, though it can work with systems that use them. The Sensi doesn’t require a C-wire for installation, which means it’s compatible with the vast majority of HVAC systems. The provided step-by-step instructions guide you through how to wire the thermostat, and the Sensi website claims that the thermostat can be installed in 15 minutes or less. However, professional installation is available if you feel you can’t (or don’t want to) install the thermostat yourself. The Sensi is compatible specifically with heat pump, gas, oil, geothermal, and radiant systems, and the lack of a C-wire means you won’t need to take any extra steps or install adapters to make the Sensi work. At a lower price point than the Nest and the ecobee3, the Sensi is a great entry point for someone looking for a basic smart thermostat. The ease of installation also makes it a good choice for someone installing a thermostat on their own for the first time. The Sensi doesn’t stand out in many ways, but what it does do, it does well. 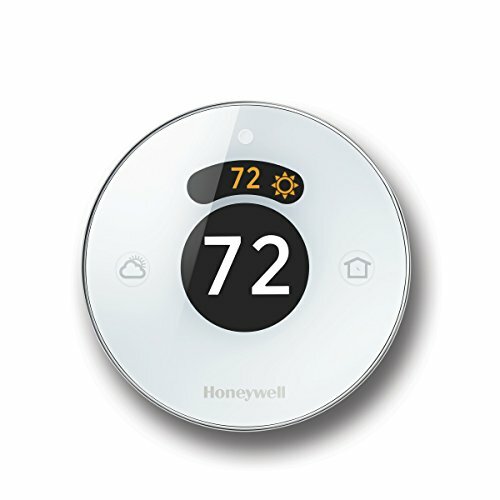 Honeywell is a well-known brand for everything from water detectors to thermostats, and the Honeywell Lyric Round is one of the company’s most popular smart thermostats. Its aesthetic build and easy functionality make it a popular choice among homeowners. The Lyric Round uses geofencing to detect your location. When you’re away from home, the thermostat lowers or raises the temperature to save energy, and then it activates shortly before you arrive to ensure your home is comfortable when you get there. You can also set guidelines so the temperature remains in a certain range while you’re gone—useful if you have pets or delicate plants in your home. The Lyric Round sends alerts if the temperature swings too far in either direction, as well as when the filter needs to be changed. These alerts let you keep an eye on potential problems in your home. For example, a sudden temperature increase in the summer could mean an open window or air conditioning problems. The temperature alerts also allow you to stay on top of your system’s status and ensure everything runs at its best. Because the thermostat takes humidity into account, it can make minute changes to ensure your home feels comfortable, so you won’t have those days where it feels stifling in your home even when the thermostat is set at 72 degrees. The thermostat can also integrate with your home automation system via Apple HomeKit or Samsung SmartThings. Through HomeKit, you can give vocal commands to your thermostat to have it automatically lower the temperature when you turn off the lights in your home. The Honeywell Lyric Round can be installed either professionally or on your own. Honeywell provides a user guide to help with installation, but the guide works best when used with the Lyric app. The app will guide you through the installation of the thermostat step by step. The Lyric Round can automatically adjust the temperature in your home without the need for you to set up a complex schedule. The geofencing is icing on the cake—by automatically detecting your location through your phone, the thermostat is able to turn itself on or off and save a lot of energy while doing so. 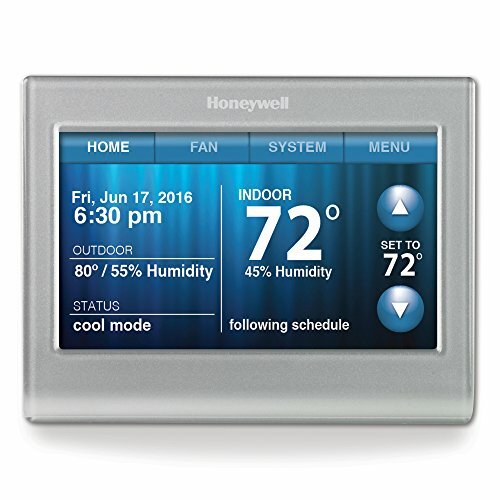 Like the Sensi, the Honeywell Wi-Fi Smart Thermostat is programmable. You can set up a schedule ahead of time to ensure that the temperature is exactly what you want it to be at any given time. The Wi-Fi Smart Thermostat uses a custom seven-day schedule to keep your home at your preferred comfort level, but it also learns your heating and cooling preferences and begins changing the temperature gradually. This slow change means the HVAC system doesn’t have to work as hard to make a sudden temperature shift, resulting in further energy savings. The thermostat’s energy-saving mode keeps your home within a set temperature range while reducing how much the HVAC system runs. You can activate the energy mode remotely from your phone, like when you arrive at work, or you can set it to activate on a timer. The Wi-Fi Smart Thermostat, like the Lyric Round, alerts you of sudden temperature changes and lets you know when it’s time to change the filter. An indoor humidity sensor lets the system compensate for high humidity, which means your home will feel comfortable no matter how humid it might be. 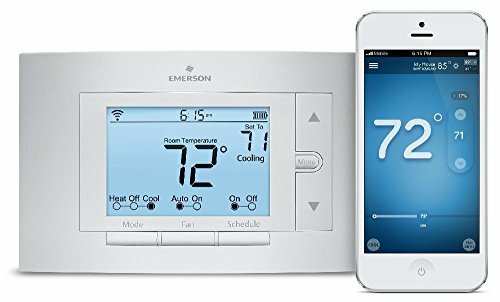 The thermostat is compatible with Amazon Echo, Google Home, IFTTT, Wink, and Samsung SmartThings, allowing for use with almost every major home automation system on the market today. The Wi-Fi Smart Thermostat requires a C-wire for power, so if your HVAC system doesn’t have one, you may not be able to use this thermostat with it. However, in some cases, a G-wire can be used in place of the C. The Wi-Fi Smart Thermostat comes with a guide that walks you through the installation process, but professional installation is also available if you’re not comfortable doing the task yourself. Like other Honeywell thermostats, the Wi-Fi Smart Thermostat works with low-voltage systems, but is incompatible with anything above 110v. The Wi-Fi Smart Thermostat is a decent alternative to the Sensi, but doesn’t offer enough to justify a higher rank than the Sensi. It’s still a solid choice for a programmable thermostat, and the fact that it learns your patterns is an added bonus. A smart thermostat can save you money, keep you and your family comfortable, and integrate with myriad smart home devices. However, due to their nature and the possible difficulty of installation, you should consider a few things before buying a smart thermostat. How long do you intend to stay at your current location? Can you make changes? Many apartment complexes won’t allow you to modify the thermostat, which means you can’t install a smart model. If you own your home, but plan to move in the next few months or year, it might be better to wait until you’ve discovered the kind of HVAC system your new home has. You should also consider whether the system you have is compatible with a smart thermostat. Most homes use low-voltage heating systems with 24v power supplies, including gas, oil, hot water, and heat pump systems. Most 110v systems, like electric baseboard heaters, are not compatible with any smart thermostats. It’s always a good idea to double-check what system you have before purchasing a smart thermostat. One of the most important things to consider is whether your thermostat requires a C-wire. Because some older HVAC systems use high voltage, they aren’t compatible with smart thermostats, as Wi-Fi thermostats require low voltage. 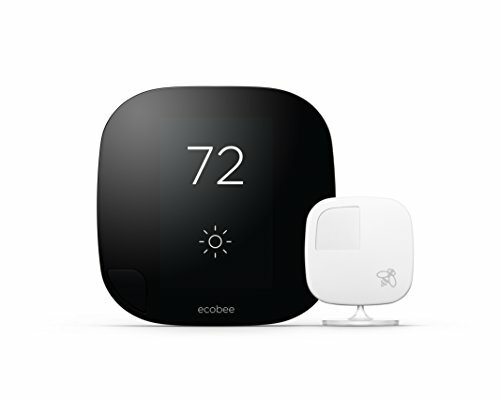 If you purchase a smart thermostat, make sure your home has a C-wire or that the thermostat comes with an adapter, like the ecobee3’s Power Extender. Alternatively, you can hire a professional to run new wires to your system. Finally, make sure you purchase the most current model. Smart thermostats become more efficient as newer models hit the market—for example, the Nest is currently on its third generation. So you’ll want to make sure you purchase a third-generation Nest, rather than a first or second. In the right circumstances, a smart thermostat can save you a lot of money, especially if you live somewhere with sudden temperature changes. Even if you live somewhere with predictable temperatures, a smart thermostat can make your life easier by changing the temperature for you. It’s one less chore to remember before crawling into bed in the evenings or leaving for work in the morning. Take the time to look at the options, figure out what kind of HVAC system your home has, and then determine whether one of these five thermostats is right for you. While we didn’t review it here, we’ve also got a great write-up on Alarm.com’s smart thermostat.